Playing the Bad Apple Records songwriters tour really lit a fire under me to try more unconventional shows. It was refreshing to play small venues for crowds that were small, but invested in the artists’ stories and songs. Many of my favorite musicians around Lexington have expanded their brands by hosting open mics and songwriters round events around town. Thus, I decided to give it a try myself. Since day one, I’ve been a squeaky wheel when it comes to networking and hustling to get bookings. When I started playing as a teenager, I’d call and send out demos to every church and community center around. Once I got a “yes”, I’d go into hype mode to draw a crowd. Once Stellar Kin reached a certain level of fame, we didn’t have to work as hard at getting booked locally. We also employed a booking agent for many of the big out of town gigs. Fast forwarding back to modern day, I decided to work my connection with Lexington Public Library (my wife works there) to set up a series of events there. I met with staff about setting up a monthly songwriters round. The Eastside Branch is the newest, most state of the art location, just about a year old at the time of writing. Since LPL Eastside was not providing funds for the events (just the space, coffee, and doughnuts), I got creative in securing compensation for the artists. I solicited the Doo Wop Shop for sponsorship. In exchange for us hanging their banner, Doo Wop agreed to provide rental credit gift certificates for the performers. Just like in my early days, I hustled to make something out of nothing. 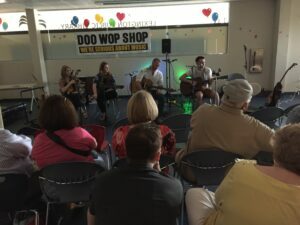 Thus far, the events have been a success, getting local songwriters exposure to new audiences. After the first three, LPL renewed the series for three more dates, extending into August.